Wahey! Busy again tonight. Had loads of requests which is why the newer tracks are crammed towards the start of tonight’s playlist and there are loads of old faves like Le Tigre, xThrowdownx and At The Drive-In. Tonight’s best new track was the amazing ‘Milkman’ from the identically titled album by Deerhoof. 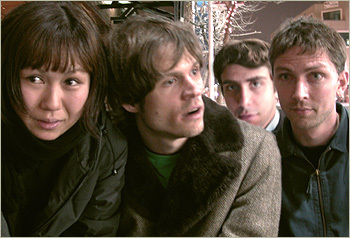 The new album maintains Deerhoof’s unique mix of experimentation and great pop tunes. Honestly, this is the kind of rock band that should be in the charts instead of all the retro clag clogging it up, like cocking Jet. Go and buy the album NOW!